Justice of the Peace Commission from the collections of the Worthington Historical Society (WHS) may be used for educational purposes as long as it is not altered in any way and proper credit is given: "Courtesy of the Worthington Historical Society, Worthington, OH." Prior written permission of the WHS is required for any other use of Justice of the Peace Commission. Contact WHS at info@worthingtonhistory.org to request permission. Justice of the Peace Commission is text. Its dimensions are 7 in x 12.38 in. 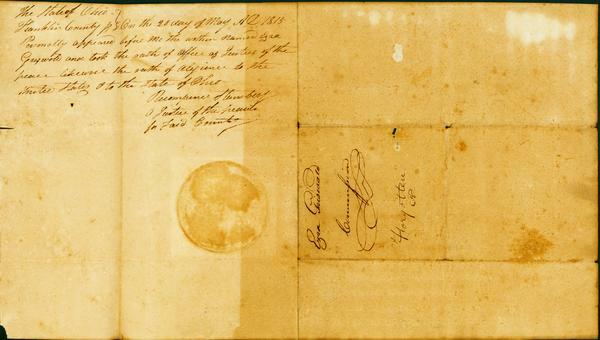 It was created on Friday, April 21, 1815. 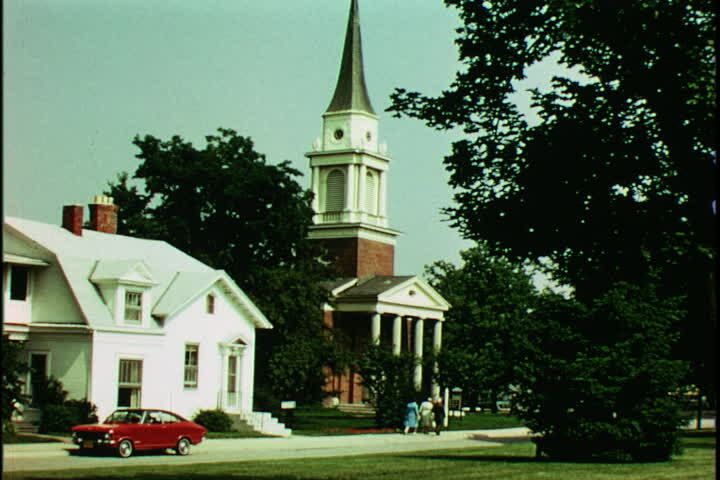 Worthington Historical Society is the Contributor. Thomas Worthington, 1773-1827 is the Creator. 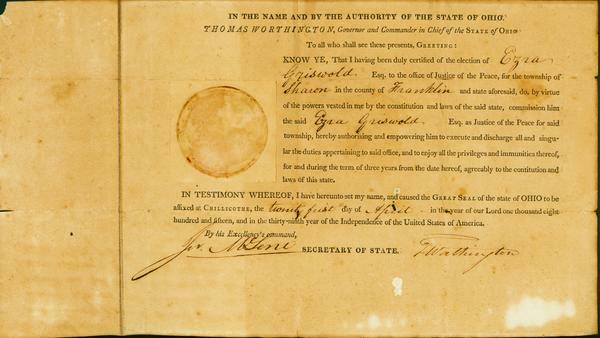 Scioto Company proprietor Ezra Griswold served as Justice of the Peace almost continuously from 1808-1821. This document is Ezra Griswold's Justice of the Peace Commission. The Affirmation of Oath signed by Recompence Stimsbery appears on the verso. Justices of the peace were first line of civil authority in Ohio, which had adopted the county and township form of government. Justices had the authority to perform marriages, write deeds, settle debtor claims, and administer oaths of office. They also advertised for lost animals, a common occurrence with unfenced fields. The justices worked part-time, and collected fees for their services. It covers the topics Chillicothe, OH and Justices of the Peace. It features the people Ezra Griswold, 1767-1822 and Thomas Worthington, 1773-1827. The Worthington Memory identification code is whs0444_001. This metadata record was human prepared by Worthington Libraries on March 18, 2002. It was last updated October 13, 2017. Before there were police forces, early Ohio towns relied on justices of the peace to maintain law and order. Our June exhibit explores some of these early representatives of the law.